Every now and then I think that I should do more studio pet portraits, but I haven’t got round to doing anything about it for such a long time. 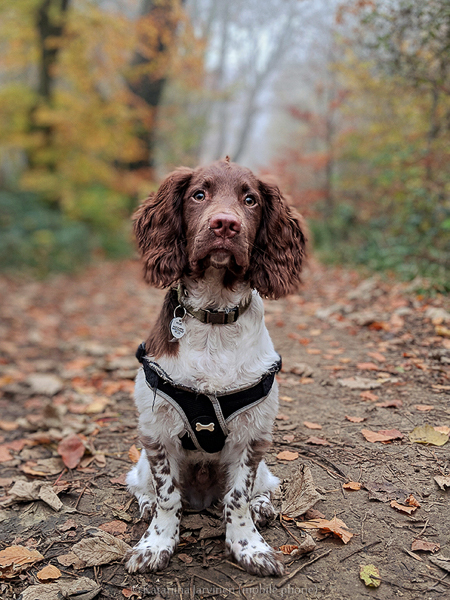 There have been so many other things to photograph and time is limited – especially when you have a puppy to look after while also trying to run a self-employed, hands-on business! But more about The Pocket Rocket some other time. ;-) As I haven’t had time to tell anyone about my studio pet portraits for so long, I thought I’d put the word out there so that you know I’m still doing them. This was one of the first studio portraits of someone else’s dog I took. He is a Weimaraner called Barker and I head-hunted him one day when I was walking my own dogs. Barker was only six months old, and ran around my home studio like a hurricane. It was quite hilarious: picture a scene where this big, gawky puppy is thrashing around the room, me following behind trying to catch studio lights and tripods before they tipped over in his wake, and shooing him off the paper background before he ripped it into pieces. It went on like that for about 10-15 minutes, but I didn’t give up hope of getting his portrait. Finally, I managed to calm him down and sit down on the floor in front of my lights and camera. I had to be very much prepared, though! He was sitting sideways facing his owner for a precious 5 seconds before bolting off again. During those 5 seconds I made a funny noise, he turned his head to see what on earth was that, and I got the above shot. And this, of course, is another perfect example of “never believe a photo”. In this portrait he looks like he’s a very calm and collected young dog. You probably don’t even believe that whole story about running around my studio just before this photo. I so wish someone was filming it. When my Zebedee graduated from puppy school (or maybe it was middle school), I took his first formal studio portrait. Zebedee was very clever and adabtable dog from a puppy and got used to posing for me pretty quickly. Actually, I just remembered that Barker wasn’t my first dog portrait sitter – it was this beautiful white giant poodle! As you can see my lighting skills weren’t stellar back in 2007 – I had just got my first set of studio lights and started experimenting with gels etc. I quite like the result, even though I would do it completely differently nowadays. Would you like to have a beautiful, well lit portrait of your dog? If you would, send me a quick email or give me a bell on 07951-635802 and we’ll make it happen! My home studio is in Brighton And Hove.